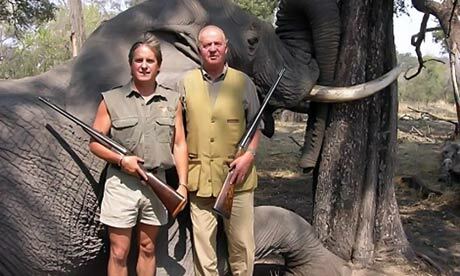 While ordinary Spaniards cope with harsh austerity, recession and soaring unemployment, the country’s royal family has been enjoying expensive hunting trips, the latest of which has resulted in a great white Spanish elephant known as King Juan Carlos ending up in hospital. The 74-year-old white elephant’s fall in a park in Botswana comes as the cost of the holiday has been revealed to be upwards of $8,700 (£5,500) and is described as a chance to experience the magnificent diversity of African wildlife, plus a further $15,000 to kill it. A day out with a professional hunter, seen in the picture above standing next to the brain-dead Spanish white elephant, costs a further $2,000. The white elephant’s accident, after which he was flown back to Madrid for a hip operation, is just the latest example of the Spanish population of white elephants’ penchant for shooting themselves in the foot, as it comes only days after Juan Carlos’s grandson, 13-year-old Froilán Marichalar, shot himself in the foot while hunting in Spain. And six years ago, officials dismissed as ridiculous allegations that the white elephant was shot by a drunken Russian bear that had been plied with honey and vodka. In 1965, the same great white also managed to shoot and kill his own brother in an accident when he was a teenager. You have to manage the world’s parasitic populations, to the betterment of everyone else. Research has shown that as much as 1% of the world may be infected by parasitical lifestyles, which if left to continue breeding, will be much to the detriment of the rest of the 99%. In fact, if any other countries would like their white elephants taken care of, we’d be quite happy to oblige. And for an extra thousand or so, we can even arrange for them to be stuffed and their heads put on a plaque as a trophy if you want. Sick bastards … Lets play “Hunt The Rich” and see how they like it! ‘The royal family has a troubled history with guns. The king shot and killed his brother in an accident when he was a teenager.’… ?? I can see why you wouldn’t want to extend the ‘culling’ analogy… but there does seem to be a certain royal family carelessness around fire-arms. Is it just me or is there something very Shakespearean about the King of Spain killing his brother. Was his brother older than him I wonder…….? His brother was heir apparent, apparently. Blimey, really? Are you thinking what I’m thinking?